In the United States, about 50 percent of marriages end in divorce according to the Centers for Disease Control and Prevention. Adults who want to share their lives with others start new relationships, and many remarry. When divorced parents find new partners, step families are created. There is a special holiday that celebrates these family units: National Stepfamily Day. The official date for National Stepfamily Day in the U.S., along with other countries who recognize it, is September 16. This day is designated as a time for step families to spend time together and for children to honor their stepparents. The first National Stepfamily Day was founded by Christy Borgeld in 1997. The holiday was created in order to give step families a day to celebrate a strong family structure, give recognition to individual family members and instill a sense of responsibility in all extended family members. Communities across the U.S. celebrate the day at organized picnic gatherings. Families who cannot participate are encouraged to plan their own individual family activity on the date. Plan to do something special with your family on National Stepfamily Day this September 16th. If your local community doesn't have anything planned for this holiday, don't let that stop you from starting a new family tradition. It doesn't matter what you do, how much it costs or how extravagant you want to be; the key is spending time together. Go get a professional family portrait taken. Create a blended sand bottle that represents your family. Give each family member a package of colored sand (or make your own with sand and food coloring). Take turns pouring the sand into a tall glass bottle. The end result symbolizes how you are all individuals that create one beautiful, united family. Set the dining room table with your finest linens and china. Serve each family member's favorite food for the meal. It doesn't matter if all the items go together or not! Start a family cookbook by compiling everyone's favorite foods along with funny or nostalgic anecdotes about memories with the items. Write letters to one another about what you love about each family member and what makes the person special. Plan a family camp-out in the backyard or a slumber party indoors. If you're outside, look at the constellations, roast hot dogs and make s'mores. If you're indoors, pop popcorn, play board games and watch movies. 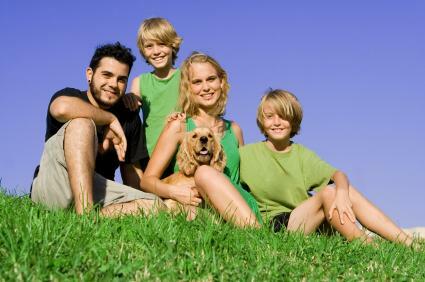 Plan outdoor family activities if the weather is nice. For years when the holiday falls on a weekday, plan a family fun day the weekend before or after the holiday. This holiday will be celebrated for the 15th time in 2011. Celebrate and honor your unique and special family by spending time together in any way that your family finds fun.